Wyndham Destinations has unveiled its newest vacation ownership resort, WorldMark Portland – Waterfront Park, designed to provide an escape right in the heart of the city. 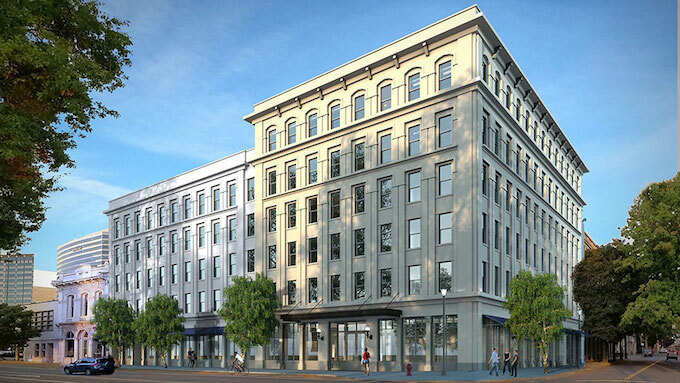 The new resort will offer owners and guests spacious, locally inspired accommodations, with an architectural design that honours the resort’s historic location in the heart of downtown Portland, Oregon. The new property is anticipated to open in summer 2019 and WorldMark and Club Wyndham owners can already reserve their stay for arrivals starting in June. Set in the Skidmore/Old Town Historic District – one of the original districts developed in the city – and neighbouring the oldest building in Portland, the resort’s historic location will be reflected throughout its exterior and interior design, marrying industrial touches with modern interpretations of classic elements. Wyndham’s design team is working with local firms to bring to life details that pay homage to the area’s rich past, from the building’s cornices – inspired by a 1920s image of the same street – to creating replica cast iron columns out of locally salvaged antique materials. Once inside, travellers will start their Portland adventure in a beautifully designed lobby featuring exposed beams with floating oversized craftsman plaster ceiling panels. The industrial look is carried throughout the reception area – which will also serve as a lounge for owners and guests – combining metal elements and a natural color palette with vibrant accents to complement the urban-meets-classic lines. The six-storey building will be environmentally friendly, with energy saving efficiencies including LED lighting throughout, occupancy sensors, tankless water heaters, and a green roof landscaped with grass and local flowers. Other amenities will include an interior courtyard and outdoor lounge with grills and space for outdoor activities, ideal for a family cookout. Located just across the street from the Willamette River, guests staying at the new WorldMark Portland – Waterfront Park will be in the centre of a vibrant dining and shopping district and just steps away from Tom McCall Waterfront Park, home to a variety of outdoor events and most of the city’s summer festivals, including the Saturday Market – the largest arts and craft outdoor market in the US – the annual Portland Rose Festival, Oregon’s Brewers Festival, the Blues Fest and more.